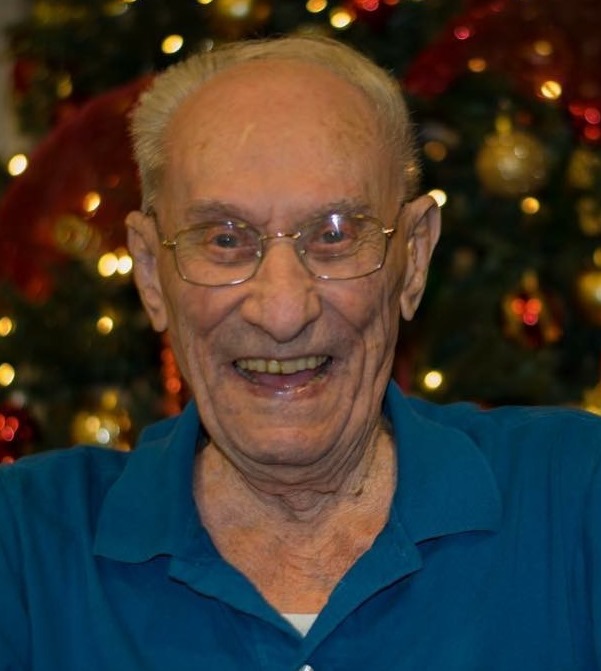 Hobert L. Justice, age 98, passed away peacefully at his home in Sevierville, TN surrounded by his family. His wife, Sarah Justice, preceded him in death on December 24, 2014. They were married for 72 years and raised a wonderful family together. He was born October 4, 1920 in Fish Trap, KY to William “Bud” Thyce and Janie Justice and worked at the Allegany Mine Company in Kentucky and then later for the Lorain Creamery in Ohio until his retirement. In 1940, Hobert enlisted in the Army and served during World War II. He spent the majority of his time in the 39th Infantry as a light mortar crewman. He was active in the European Campaign, marching from Africa to Germany before being injured and was awarded 3 Bronze Stars, American Defense Services Good Conduct medal and the Purple Heart. After being injured, he served in the 815th Military Police Company until his discharge. Hobert was a former Moderator and current member of Little Edna Church in Lorain where he loved to feed his church family and was blessed with many friends. He enjoyed golf, gardening and fellowship with his church family. He had a bigger than life smile and laugh. That, along with his never ending stories to share, endeared him to everyone he met. His kind, gentle soul and unconditional love will be his legacy. Surviving are his children, Ann (Robert) Ginn of Sevierville, TN, Janie (David) Sowards of Paintsville, KY, Sharon Meinke of Sevierville, TN, H. Dale (Pamela) Justice of Columbus, OH and Tonya Justice of Greensboro, NC; sisters, Cleo Birchfield of Vinton, OH and Doris Ann Leedy of Lexington, KY; 8 grandchildren, 5 great grandchildren and 1 great great grandchild. He was also preceded in death by both parents; siblings, Ernest Justice, Braxie Thacker, Frona Rowe and Larry Justice as well as his granddaughter, Heather Howard. Family will receive friends on Wednesday, February 6 from 4 – 6 p.m. at the Dovin Funeral & Cremation Specialists, 2701 Elyria Avenue, Lorain, OH with services to follow. Funeral services will be held on Thursday, February 7 at 11:00 A.M. in the funeral home. Burial will follow at Resthaven Memory Gardens, Avon.